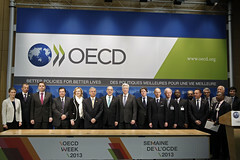 A wide range of countries participated in the signing ceremony at the OECD. Austria, Belize, Estonia, Latvia, Luxembourg, Nigeria, Saudi Arabia, Singapore and the Slovak Republic signed the Convention. Burkina Faso, Chile and El Salvador signed a letter of intention to sign the Convention. Belize, Ghana, Greece, Ireland, Malta, and the Netherlands including its Caribbean islands (Bonaire, Sint Eustatius and Saba) and Aruba, Curaçao and Sint Maarten deposited their instruments of ratification. In addition, Morocco recently signed the Convention. The G20 has consistently supported the Convention. At their last meeting G20 Finance Ministers and Central Bank Governors stated, “In view of the next G20 Summit, we also strongly encourage all jurisdictions to sign or express interest in signing the Multilateral Convention on Mutual Administrative Assistance in Tax Matters and call on the OECD to report on progress”. With taxpayers increasingly operating worldwide, tax authorities are moving from bilateral to multilateral cooperation and from exchange of information on request to other forms of co-operation such as automatic exchange of information. The Convention, provides a comprehensive multilateral framework for such co-operation and complements other initiatives, such as the standardised multilateral automatic exchange model being developed by the OECD and its G20 partners and efforts underway in the European Union to improve automatic exchange. The Convention also provides for spontaneous exchange of information, simultaneous tax examinations and assistance in tax collection. A valuable tool for governments to fight offshore tax evasion, the Convention also ensures compliance with national tax laws and respects the rights of taxpayers by protecting the confidentiality of the information exchanged. The signatories to the Convention are: Albania, Argentina, Australia, Austria, Belgium, Belize, Brazil, Canada, Colombia, Costa Rica, Czech Republic, Denmark, Estonia, Finland, France, Georgia, Germany, Ghana, Greece, Guatemala, Iceland, India, Indonesia, Ireland, Italy, Japan, Korea, Latvia, Lithuania, Luxembourg, Malta, Mexico, Moldova, Morocco, Netherlands, New Zealand, Nigeria, Norway, Poland, Portugal, Romania, Russian Federation, Saudia Arabia, Singapore, Slovenia, South Africa, Spain, Sweden, Tunisia, Turkey, Ukraine, United Kingdom, and United States.